Every preseason game a team plays in the NFL is different than the others. In their first game teams don’t want to expose their starters to any risk, in the third they want the starters to play most of the game, and so on. Because of that there is inevitably going to be a fair bit of change and adjustment from game to game - yet another reason why preseason games can be a challenge for those betting on the NFL Preseason. Rams’ offensive line - The Rams just spent more money on a rookie than any other team has ever spent, and they plan for him to be the centerpiece of their franchise for years to come. If things continue like they were on the weekend, though, then they’ll be looking for another franchise quarterback soon. Sam Bradford played pretty well overall, and very well if you consider that the offensive line in front of him was essentially a turnstile. Last year St. Louis used their second overall pick on Jason Smith - the offensive tackle out of Baylor. I am not exaggerating even slightly when I say that I don’t think I would have played any worse than Smith did in this game. Playing right tackle, Smith was consistently overwhelmed by the players across from him. In one particularly stunning sequence he was beaten three times in a row - two of which ended with Bradford being sacked. Smith was by far the worst lineman, but he wasn’t the only problem. In general, the line was shown to be a long way from prime time, and that’s very bad news for a team trying to rebuild around a quarterback - and one for which the run has been the only real bright spot recently. The Rams are going to have to make some tactical and perhaps personnel changes on the line immediately. They really have no choice. Bills’ running game - Buffalo just can’t catch a break. They don’t really have a quarterback of note, so the offense was destined to be built largely around the running game. It seems like destiny for this hard-luck franchise, then, that they would have not one but two concerning injuries right off the bat. Fred Jackson broke his hand and is out for up to six weeks, while Marshawn Lynch’s ankle injury could keep him out about as long. Barring complications this shouldn’t be an issue too far into the regular season, but it does put them in a tough spot for the rest of the preseason. Rookie C.J. Spiller did enough in the first game to get people very excited about his potential, so the team isn’t going to want to overexpose him because an injury to him would be disastrous. They also don’t intend to line Spiller up exclusively as a running back. These injuries and their protectionist instincts should force Buffalo to change things up significantly. Denver’s depth chart - Tim Tebow was only okay in his pro debut. He did some things well, but he also struggled more than would have been ideal, and his much-discussed new delivery certainly doesn’t seem as stable and ingrained as it needs to be. What the first preseason game seemed to make clear, though, is that the Broncos probably can’t afford to be overly patient with Tebow. Kyle Orton has had a very good camp so far and is rock solid as the starter. Brady Quinn is another story, though. He hasn’t looked good in camp, and he was truly terrible in the game action. It’s hard to think that Josh McDaniels could leave Tebow at third on the depth chart so that he can develop - no matter how patient he wants to be. Pittsburgh QB situation - The Steelers’ have a fairly unique challenge this year - they need to find a starting quarterback for the first four to six weeks of the regular season. Big Ben will be back then, but they need to make sure that there is still a shot at all the glory to be had by then. Byron Leftwich has been viewed as the answer, but he sure didn’t look like it in the first game. Dennis Dixon, the former Oregon star, looked very much like a starter - and a star - in his action. He passed well, ran very well, and generally looked like he owned the field. You have to be careful not to get too excited - Dixon only played against the second stringers from Detroit - but the pressure is going to be very high on the Steelers to get this right, and Dixon certainly has momentum on his side. Bears backup QB situation - The Bears have serious issues with their backup quarterbacks - even worse than they did before this last game, and it was already pretty ugly. 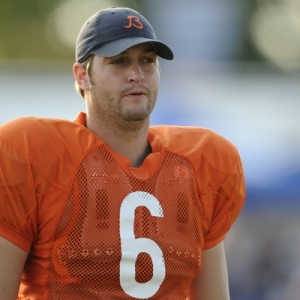 Despite having good reason to be uneasy about Jay Cutler after his dismal year last year, the Bears assembled perhaps the worst stable of backup quarterbacks of any contender in the league. It took just one game for that lack of depth to become an issue. Caleb Hanie, the team’s presumed second stringer, sprained his shoulder and is likely out until the regular season. The Bears didn’t make an immediate move to bring in a new arm, but there is little question that this slap in the face with reality will force them to change their approach somewhat. The frightening reality is that this team is now just one injury away from having Brett Basanez as their starter. Doc’s Sports is on an 11-2 run for member’s NFL picks in the NFL Preseason this year and last and we are very excited about the rest of the 2010 slate of exhibition games. Our picks against the NFL line for the entire NFL Preseason are just $49. Also, our Early Bird Special for the NFL full season is just $695 and that will get you all the picks from the first kick in preseason to the Super Bowl (normal price will be $950). Check our home page daily for NFL handicapping articles and up-to-the-minute updated odds.